Not only is this your new location to listen to the latest episodes of the Virtual Pizza podcast, but also we’ll be bringing you news and articles from the media and technology world! Remember you can also subscribe to the show on iTunes and please remember to leave a review, it really helps us get out to more listeners! So, make sure that you like us on Facebook, follow us on Twitter, and signup to our newsletter! This wordpress.com site will slowly be phased out, please visit the new site and follow us there! Virtual Pizza: Episode 10 – the Horror Special! After a very long break, welcome to Episode 10 of Virtual Pizza, devouring the digital world, one slice at a time. This episode has a special horror theme! Remember, tickets are still available for the Back to the Theatre Brian Cox event on September 28th, where Manhunter and Trick ‘r’ Treat will be screened with the great man himself in the audience! You can contact Virtual Pizza at virtualpizza.podcast@gmail.com , follow us on Twitter @virtualpizza, like us on Facebook and subscribe to our YouTube channel! Don’t forget to leave us an iTunes review! Enjoy the show and tell your friends! Back in 2012 I was approached by a Sunday Times Magazine journalist to be involved in an article on Extreme Commuting. Matt (Rudd) wanted to experience part of my 9 hour daily roundtrip commute. Some of you may remember the article, Matt wimped out after a few hours, leaving me to continue on my own… cheers Matt. Noted. At the time, Matt had mentioned that he was part way through writing his new novel, which would be examining the English way of life. Now, I have to admit, this type of book usually does nothing for me, and what little precious reading time I have is spent reading science fiction. However, when I saw that Matt’s book, The English: A Field Guide, had been published by Harper Collins (and that there was a chapter on commuting! ), I made my one-click purchase. At 310 pages long, I settled down to start, ignoring the immediate temptation to jump straight to chapter 4 ‘The Commuter Train’ (page 107 to be exact if you’re really interested). By the end of the Introduction, I was hooked. With some real laugh out loud moments (which in typical Britishness I rarely do when reading), genius footnotes, the author has put together a fantastically funny piece of work. There are a lot of home truths that you automatically relate to, and Matt’s self deprecating wit gives it an honesty that feels fresh. This humour is not staged or contrived, this is the author. ‘My’ chapter, was of course sublime, and the above line certainly put me in the good books with Mrs.O! Despite my connection with the book, I can honestly say that I haven’t enjoyed a book this much in a long time. It hit a number of recognition chords and I really did find myself smiling throughout. It’s an easy read, I finished it in a couple of sittings, and as I write this post, remembering the stories, I think I’ll start reading it again. A rarity. 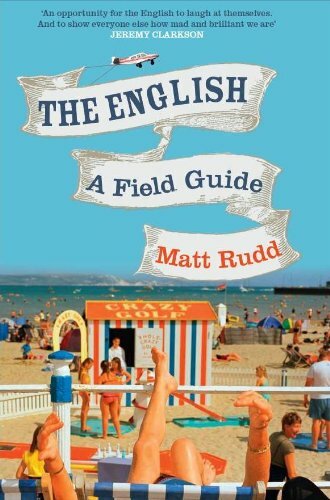 Highly recommended, Matt Rudd’s The English: A Field Guide , published by Harper Collins, is available from Amazon, and at time of posting, it’s currently priced at a very reasonable £8.27 for the paperback (£5.99 Kindle edition). You can also follow Matt on Twitter @MattRudd. I’ve recently become addicted to Goodreads, but more about that later. One of the functions of Goodreads is that my book reviews will be automatically published onto this blog. To do that I need to find my blog’s post URL, which is easy to find in the source code of your blog web page. But if your doing this on an iOS device, there’s no option in Safari to allow you to view the source! Check out the first of hopefully many, Virtual Pizza: The Slice. In this Slice we take a look at 5 of the most anticipated shows coming to your screens in 2013. Welcome to Episode 09 of Virtual Pizza, devouring the digital world, one slice at a time. Our question of the week is: what non-US TV show would you recommend? You can contact Virtual Pizza at virtualpizza.podcast@gmail.com , follow us on Twitter @virtualpizza, like us on Facebook and subscribe to our YouTube channel! Survey: Please tell me what you think! As previously discussed, I’d like to find out what you, the listener, really want out of the Virtual Pizza podcast. Please click the link below and take 5 minutes to take this survey. The results will be really useful in working out how the show is going to continue into the new year and beyond. Many thanks in advance for your responses! !